Ever found lost in spirituality of senses and depths of devotion or ventured in subjects like history of religion, geography of astrology, mathematics of zero and so on, so forth? The answer might not come in one easy guess or grasp, unless one is researching about Ujjain - a city where all merge to give it the meaning it stands for. Flourishing on the banks of River Kshipra, this city in Madhya Pradesh is associated with best of everything since the day it came into existence, be it the presence of one of the Jyotirlinga - Shri Mahakaleshwar Mandir, or being one of the four place where mythological nectar fell for Kumbha Melas to happen or its identity for being a home to individuals like Brahmagupta, Varahamihira, Kalidas, Ashoka, etc, and this could be continued for long; so strong is the significance of the place to limit in few words. Known by many different names as Avanti, Avantika, Ujjaini, Avantikapuri, Arin, Ozein and Aryn, depending upon the cause it was needed to be named so, it has always welcomed the pilgrimage with the open heart. The history of the place as hinted before goes long back in time, a time when life had different things to worry. Some of that part is only in the conscious wakefulness of 'Time' and no one else, but the other part of which credential references are present. Trade of finest pottery, pearls, gemstones, precious metals, perfumes, silk and muslin, etc, prominence of Buddhism through Gautama Buddha, various dynasties that changed with the power, subjects like astrology, Sanskrit literature, mathematics and science that flourished here make Ujjain for what it is being visited by numerous tourists in addition to pilgrims who visit it. The Mahakaleshwar Jyotirlinga Temple was built by Scindia ruler Srimant Raanojirao Shinde Maharaj in 1734 AD, developed further by many other prominent personalities in the same lineage. The temple has the Swayambhu Lingam facing south and hence named Dakshinamurti along with the idol of Parvati, Ganesh and Karttikeya. 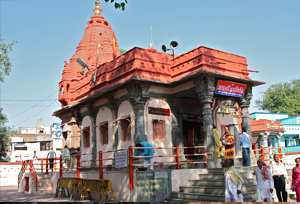 The same place, i.e Ujjain also has one of the 51 Shakti Peethas (in Harsiddhi Temple) as well, which is why the festivals of Mahashivaratri and Navratra together are celebrated here with great enthusiasm and thus act as crowd pullers. On the religious lines, there is the festival of Kumbh Mela which occurs once in twelve years at four different places, one of which is Ujjain. So, during that phase the city witnesses the biggest congregation of human on earth. 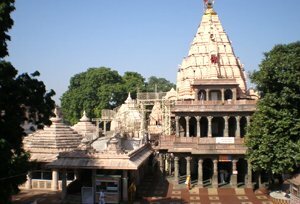 Mahakaleshwar Jyotirlingam Temple: The temple is the most venerated place in Ujjain for which people from every corner of India come to pay their visit to this place. The south facing deity is said to be in line with the tantric philosophy of Shaivism. Bhartrihari Caves: The caves are popular for the meditation by step brother of Vikramaditya named Bhartruhari as he renounced the world. His work of Shringar shatak, Vairagya Shatak, and Nitishatak are among the prime. Located at the bank of River Shipra (Kshipra), the caves are as much frequented as the nearby Gadkalika Temple. 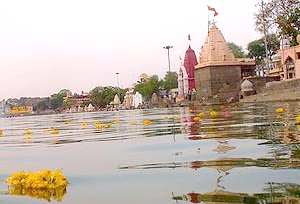 Gomti Kund: The kund is associated with the legend which tells about Lord Krishna filling it with the holy waters of all the rivers around so that his old Guru can do his daily rituals. Kal Bhairava: The temple is dedicated to one of the eight Bhairavas of Shaivism worship of which belongs to Aghori and Kapalika sects who are said to be offering liquors as prasadam as a part of ritual worshiping the Lord. The temple is said to be have built by King Bhadrasen. Kaliadeh Palace: The palace is recorded to have Persian architecture which is prominently reflected in its dome. Moreover the visits of Akbar and Jahangir is also carved there in Persian that immediately demands attention of the tourists going from there even if it is illegible to those who don't know about the language. Madhavrao Scindia is credited for restoring the temple as one can see today. Harsiddhi Temple: The elbow of Sati, holy consort of Lord Shiva is supposed to have fallen here while the Lord was carrying the dead body of the goddess in grief, making the place pious in the process and designating as one of the Shakti Peethas. This event is marked with the presence of this temple. Vikram Kirti Mandir: The centre which houses many ancient scripture and art valuables is known to have been here since 2nd millennia and presently known to have Scindia Oriental Research Institute, an archaeological museum, an art gallery and an auditorium. A curious soul can have a great time here. The Ved Shala: This observatory is renowned for the contribution it has made in the astronomy for which Ujjain holds a special place. Hindu geographers take it as first meridian of longitude since 4th century and use it for astronomical calculations. Raja jai Singh made his valuable contribution to the observatory later on. By Air: Airport at Indore is the air link it has with the rest of the India, which is 52 Km away. By Train: Well connected to the major Indian cities by train, the place is supposed to be reached conveniently through Bhopal. By Road: Well connected by roads, Ujjain is served by the buses that ply through Indore. Cars and Taxis can also be taken.